You may play this personnel at cost -2 to ignore his next ability. When you play this personnel, you may place your ship at your mission. 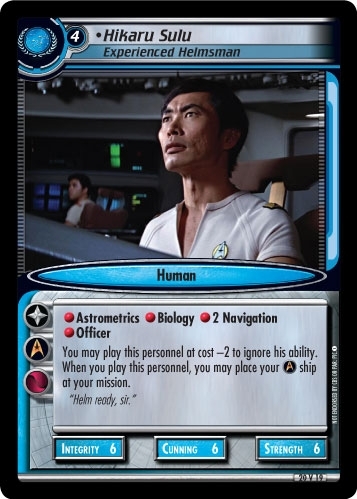 Characteristics: "relocate" ship cards, affiliation, The Original Series related, Past related, personnel who has a cost of 3 or more, personnel who has a cost of 4 or more, Human species, ship related card. Requires: The Original Series related. This card has an erratum: Discount rewording. Skill without errata: "You may play this personnel at cost -2 to ignore his ability. ".